If I could describe this melt-in-your-mouth King salmon in one word, it would be ‘euphoric’. The texture is silky and buttery, the color is a bright coral hue with distinct marbleization, the flavor is clean, and it’s got omega-3 fatty acids like whoa. King salmon all day, every day! It pains my little pescetarian heart that people tend to limit fish consumption to the warmer months. I fully understand the excitement that comes with grilling and throwing salmon fillets onto a cedar plank or impaling shrimp and scallops with skewers — but fall flavors and fish get along swimmingly, too! 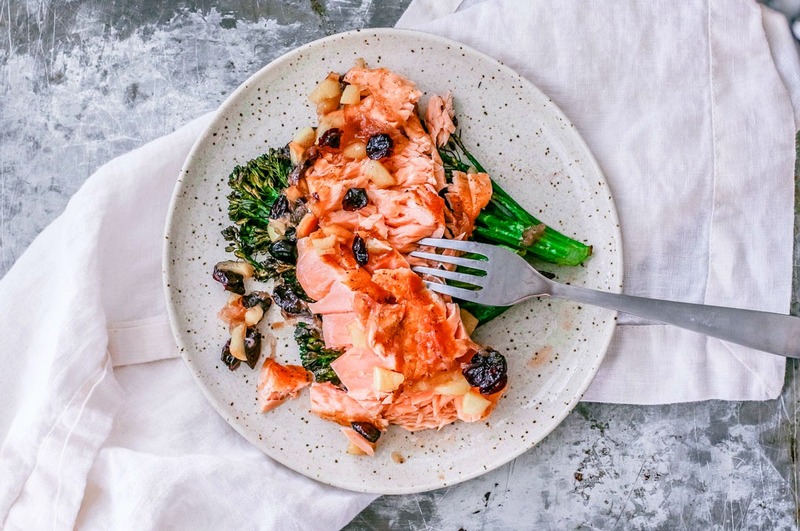 This recipe smothers your King salmon fillets with warming spices and a savory blend of apples, onions, and dried cranberries, and it’s quite possibly the best thing ever. How did I think of this? And why did I think throwing apples and cranberries onto salmon would be okay? Welp, before my pescetarian days, I’d slather this saucy medley over pork chops. And whenever I find myself searching for new ways to jazz up my fish, I think about meaty recipes I used to enjoy and try to bring the essence of those dishes to the pesce world. Fish is versatile, and it usually works out nicely. This experiment-turned-success is no exception. Regal New Zealand King Salmon has earned the Best Aquaculture Practices (BAP) certification from The Global Aquaculture Alliance and, to top that off, the New Zealand King salmon industry received the Monterey Bay Aquarium Seafood Watch Green/Best Choice rating in 2015. With that said, Regal New Zealand King Salmon is a smart choice! The word “farmed” seems to have a negative connotation, but “farmed” shouldn’t be a bad word. Both farming *and* fishing methods have good and dreadful practices. This is why it’s important to know where your food is coming from. In Marlborough Sounds, salmon production is optimal. Regal King salmon is raised in protected isolation before being transferred to sea farms in the clear, deep, and cool waters of the Marlborough Sounds where the environment for salmon production is optimal. With stocking rates resulting in only 2% of the sea farm volume being occupied by salmon, the salmon in this vicinity have ample room to swim around and be. Additionally, the absence of disease in the fish means that New Zealand farmers don’t have to use antibiotics or vaccines to maintain the health of their stocks. The salmon are fed food pellets of fish meal specially formulated for King salmon and do not contain steroids or growth enhancers. This means you can dig into Regal’s King salmon and feel GOOD about it. What’s different about King salmon? Not sure if Regal New Zealand King Salmon is available near you? Find out here! This Pan-Seared Salmon With Apple Cranberry Sauce is delicious proof that fish has a place at the dinner table throughout the cooler months, too. Remove the fillets from the fridge and, with a paper towel, pat the entire fillets dry — skin included. Sprinkle a little salt over the flesh of the fillets and let them sit on the counter for about 15-20 minutes to come to room temperature. In the meantime you can prep your ingredients for the sauce. Melt the butter in a pan over moderate heat. Add the sliced shallots and cook until lightly browned — about 5 minutes. Add a sprinkle of salt and pepper. While the onions cook, place all of the ingredients from the diced apple to the ground allspice in a medium-sized bowl; stir well to thoroughly mix the ingredients. Add the apple mixture to the pan with the onions and stir well. Bring the heat down to low and let the sauce to simmer, stirring occasionally, for 5-7 minutes or until the mixture becomes a little thicker. (In the meantime, cook your salmon.) Once thickened, remove from heat, cover, and set aside. Add a generous amount of neutral oil, like vegetable oil or grapeseed oil, to your skillet — enough to coat the bottom of the pan. Heat over high heat until the oil starts to smoke. Once the fillet is cooked, carefully remove it from the pan and set it on a plate; cover with tin foil so it stays warm. Repeat the same process for the other fillet. Once the fillets are done, plate, and spoon the apple cranberry sauce evenly over each fillet. King salmon is thicker and fattier than other cuts of salmon, so if you're using a different type of salmon, cooking times may vary. It's always best to use the 8-10 minute rule when cooking fish; measure the thickest part of the fillet, and cook the fillet 8-10 minutes per inch of thickness, flipping 3/4 of the way through cooking time. I made this for dinner tonight. The flavour is lovely! What a beautiful color and texture for that King salmon! I'm used to eating fish all year round, and this looks so good with that apple cranberry sauce! I read you article with such delight as I am really conscious about fresh fish and the way it is raised. I am now convinced Regal King salmon is the way to go. I clicked on the link and Europe is missing ! Nooo! Hi Laura! Thanks so much for the wonderful comment. I'm also sad to hear Europe is missing from the options! Hopefully it becomes an option. Might be worth sending them an e-mail - maybe they could suggest a great salmon accessible to you? Here's hoping! Sounds delicious, I'm more than happy to eat fish all year round here, sadly sea fish is a rarity in land locked Hungary though... That sauce sounds fantastic. Thanks, Brian! I'm with you. Fish all day, every day. That's too bad about your fish selection, though :( I hope you can find some good fillets and give this sauce a whirl sooner than later. Your Apple Cranberry Sauce couldn't be more perfect. I could see using this on many things. Perfect for the Regal New Zealand King Salmon especially. Looks amazing! cranberries would add a lovely flavor to the salmon. Thanks, Prasanna! They really did! This looks delicious! Love the crispiness of pan searing the salmon! Sounds great with the apple cranberry sauce!